Vancouver, BC - Skyharbour Resources Ltd. (TSX-V: SYH)(OTC Grey: SYHBF) (Frankfurt: SC1N) (the “Company”) is pleased to provide results from ground based horizontal loop electromagnetic (HLEM) surveys completed as part of the Western Athabasca Syndicate’s (the “Syndicate”) recently-completed exploration program at the Preston Uranium Project. 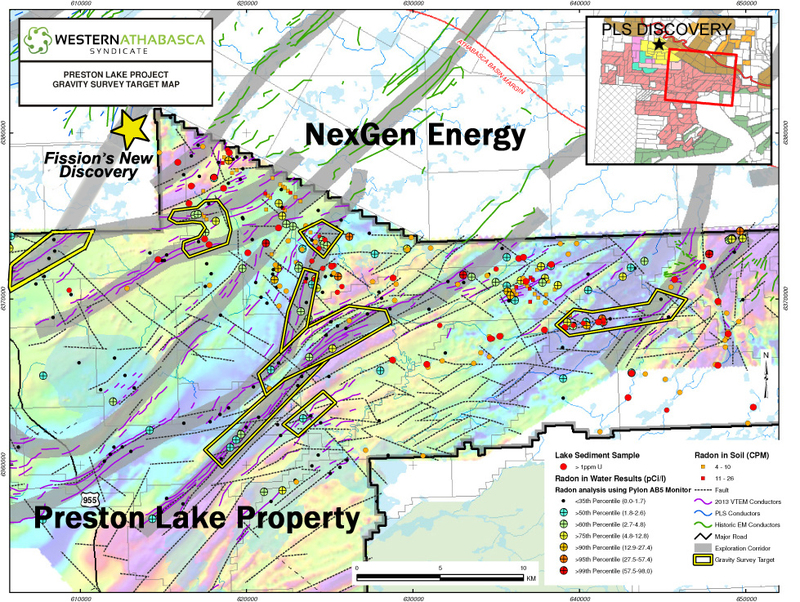 The Preston Property is strategically located proximal to Fission Uranium Corp.’s shallow, high-grade Triple R deposit, as well as NexGen Energy Ltd.’s Arrow discovery in the Patterson Lake region in Northwestern Saskatchewan. Based on the combined results of the 2014-2015 gravity and RadonEx surveys, six high priority targets were identified on which ground-based HLEM surveys were performed. Grids totaling 12.5 line-km were surveyed at the Syndicate’s high-priority FSA, FIN, Dixon, and Canoe targets. The HLEM surveys have now confirmed the presence of moderate to strong steep southeast-dipping conductors underlying the FSA, Dixon and Canoe targets. The conductors are indicative of significant faulting, graphitic-bearing rocks or geological contacts all of which may lead to the potential concentration of uranium mineralization. Anomalous RadonEx results from the 2014 and 2015 surveys within these conductor zones significantly enhance their uranium-hosting potential. The Canoe target is a particularly noteworthy target based on radon results of up to 55 pCi/l returned above the LCE-grid conductor trace array. 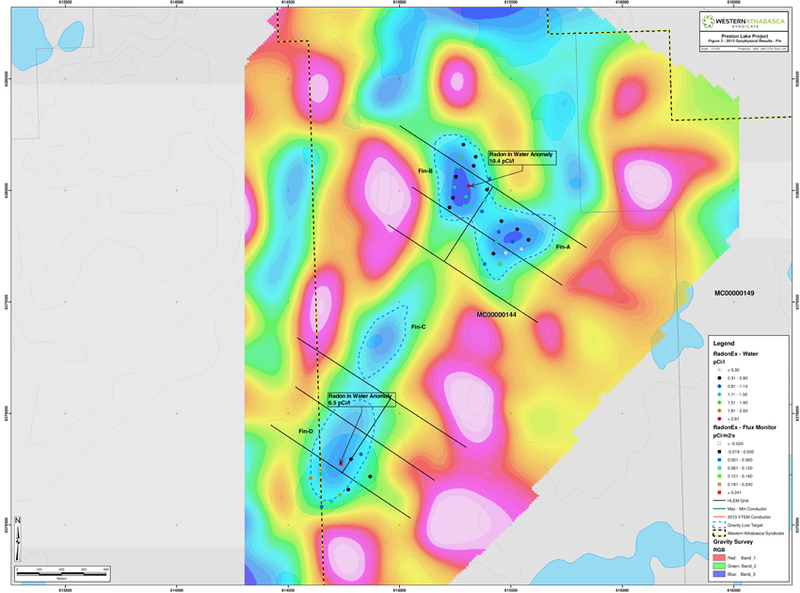 The results from the most recently-completed geophysical surveys, combined with exploration results from previous field work, are being used to prioritize and refine targets for a proposed drill program in July and August 2015 at the Preston Uranium Project. Details on this summer exploration and drill program are forthcoming. 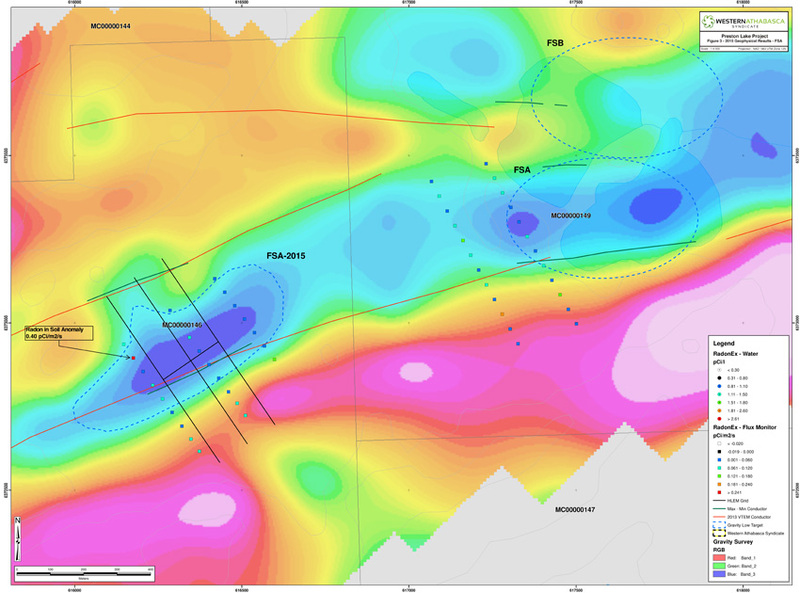 The Syndicate has recently carried out one of the largest regional exploration programs in the underexplored SW region of the Athabasca Basin. A total of approx. $4.2 million in expenditures on the Preston Uranium Project has been incurred including ground gravity, airborne and ground EM and magnetics, radon, soil, silt, biogeochem, lake sediment, and geological mapping surveys, as well as boulder prospecting and a nine hole exploratory diamond drill program. 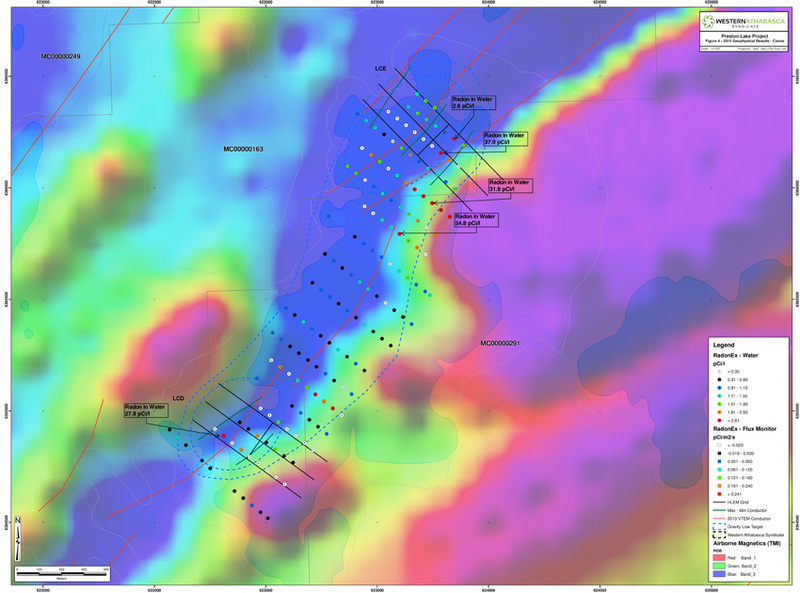 As a result of this multi-million dollar exploration program, fifteen high-priority drill target areas associated with eight prospective exploration corridors have been successfully delineated using a methodical, multi-phased exploration technique. In addition, the Syndicate holds an extensive, proprietary geological database for the project area as a byproduct of its substantial exploration work over the past twenty months. 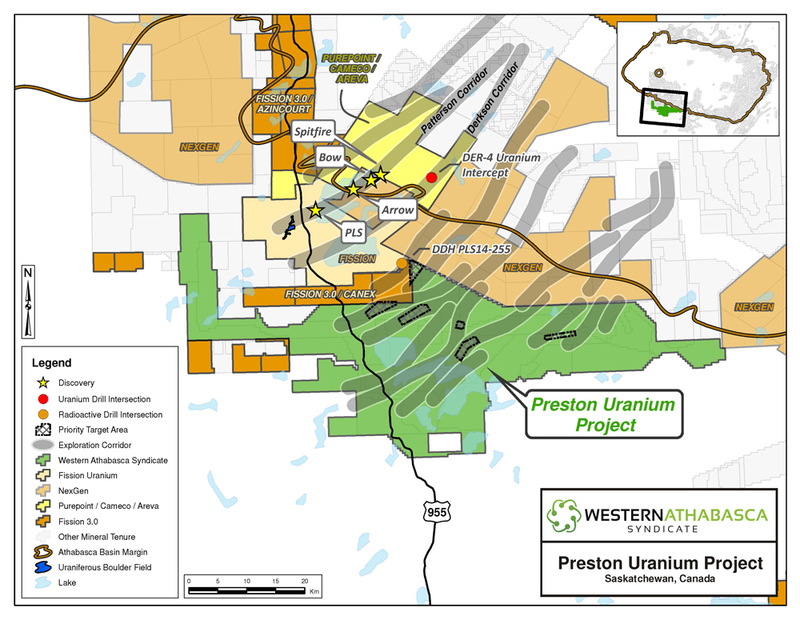 The Preston Uranium Property is one of the largest mineral tenure bases in the Western Athabasca Basin, directly proximal to Fission Uranium’s Triple R deposit and the recent discovery made by NexGen Energy on the Rook-1 Project. 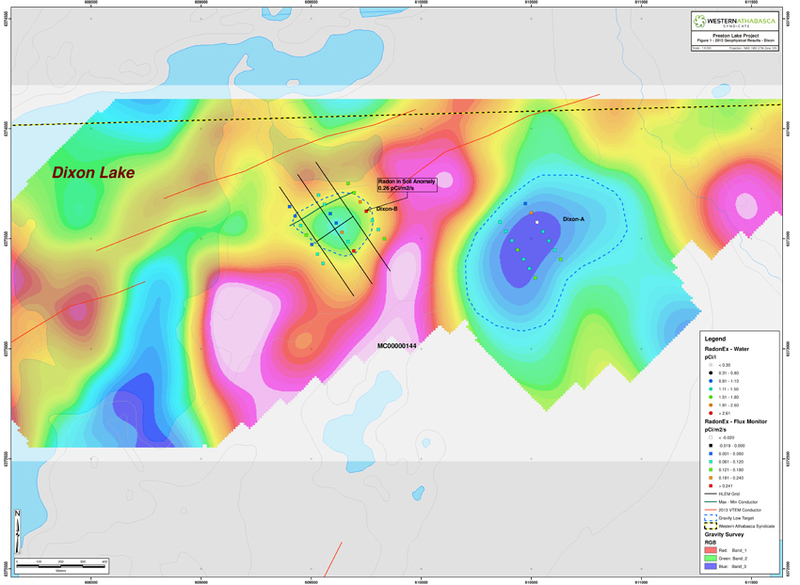 The uranium potential of the area is highlighted by results from Fission Uranium’s Patterson Lake South property with the announcement of the large, shallow, high grade Triple R deposit, which includes 79.6 million pounds at 1.58% U3O8 indicated and 25.9 million pounds at 1.30% U3O8 inferred (See Fission Uranium news release January 9, 2015). Management cautions that mineralization present on other regional properties should not be construed as indicative of potential mineralization on mineral tenure being explored by the Syndicate.